My name is Josephine Moysey, and I am originally from Broughton in Salford, although I am now living in Derry, Northern Ireland, doing my degree. 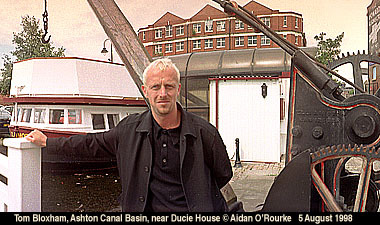 This may sound like a really bizarre question, but I was reading the stuff about Tom Bloxham on the Eyewitness thing on the manchester on-line website, and I was wondering if you knew of any way that I would be able to contact him? I think he could help me out a great deal with my dissertation. Any help would be greatly appreciated. Thanks a million. He's a very busy man, but if you write to Urban Splash (Properties) Ltd., Ducie House, Ducie Street, Manchester M1 2JW. he may be able to help you. Please say you found out about him in Eyewitness in Manchester. Yes, I've included those places on my list. Now all I need is some good weather! Super collection of excellent pictures.! I wish they were identified, everything has changed since I worked on Oxford St 1940-1942. I was straight out of school. Remember going into the basement every time the air raid sirens went!! Also going back to work after the Blitz, Piccadilly and Portland St were heavily bombed,What a mess!!! It's amazing the Blitz is so fresh in your mind! More detailed descriptions of locations will be included for each picture soon, and you'll be able to add your own comments on each picture as well. By the way, you have a great surname! Thanks for the enquiry. At the moment, I'm preparing a selection of prints for sale as postcards and prints 6x4, 10x8, 15x10 inches, and other sizes. I haven't fixed the prices yet. They will be available by mail, or as high resolution files for digital transfer. How many copies did you want to buy? It's the "digitally cleaned up" one isn't it, number 581? We are reading your site on a steamy Sunday afternoon in Brisbane. The English are being hammered by the Aussies at present so we thought we'd cheer ourselves up with piccies from home. As we are from Newton Heath (15 years ago ), imagine our delight to see our old stomping ground the railway hotel at Berry Brow. Any further pictures of Newton Heath would really make our Xmas in particular Newton Heath cricket club. If you get hold of Albert Walsh tell him Benny said he has to buy you a pint. 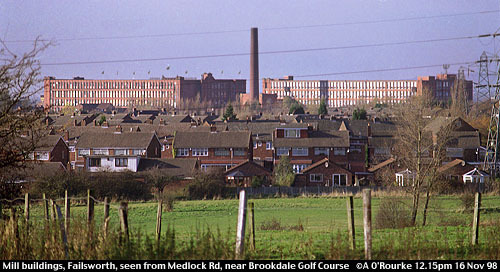 There are some more of Newton Heath - just do a search for them. I've added Newton Heath cricket club to my list. Looking forward to my pint! This photo was taken next to Brookdale Golf Club. Just read your page, it was great. Spent 20 great years in Manchester and miss it very much. I think I have a great idea for you, you should have a personal page where old frends can find each other. I have lost track of so many from Manchester and have no idea how to find them. Just a thought. Great page. Yes, that's a good idea. I may do a "guest book" where people can post "looking for" notices - there are plenty of other ones around, but an Eyewitness in Manchester one would be one extra opportunity for people to find each other. Have any other readers got ideas or suggestions?